74 vehicle parking spaces and 87 bicycle spaces. 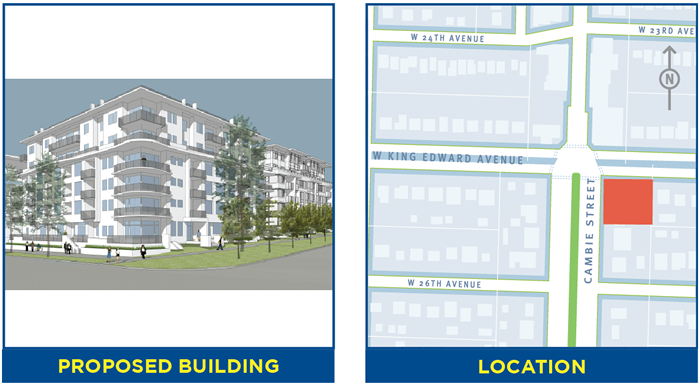 The application is being considered under the Cambie Corridor Plan. A community open house was held from 5:00 to 7:00 pm on Monday, May 14, 2018 at Phoenix Gymnastics, 4588 Clancy Loranger Way, with the applicant team and City staff available to answer questions. This application has been approved by Council at Public Hearing on March 12, 2019. 68 vehicle parking spaces and 91 bicycle spaces.